Want to start your automation journey? We offer trial options to suit users of all skill levels and all requirement scales. The scope of ThinkAutomation is huge. You can build any number of workflows, using a vast selection of ‘if’ rules, actions, integrations, and process combinations. So, we recommend that you take advantage of a free product demo before downloading. 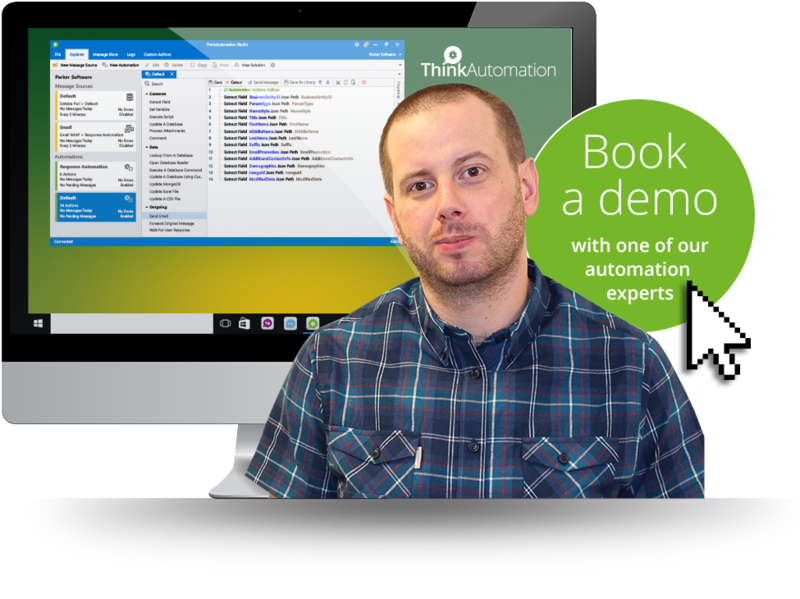 This gives you a guided tour of ThinkAutomation, and helps you get to grips with its setup. Your free trial of ThinkAutomation is fully functional, with all actions available. This means you can parse thousands of messages, process thousands of tasks, and power thousands of actions. Each trial lasts for 30 days. This gives you time to explore the product thoroughly and see the time-saving results in action. You can purchase a licence to unlock your product once your trial is complete. Your existing setup will be retained, with no need to start from scratch. Purchasing a licence also gives you access to support and updates. So, you get product improvements as they roll out and technical assistance as and when you may need it. Need advice on where and how to use automated processes? Our professional services team can help you scope out your automation project and plan the solution that works for you. Prefer an expert implementation? One of our technicians can manage the deployment on your behalf, to save you the time and effort of configuration. Want to upskill your team on automation? We can provide custom product training to help you discover and master ThinkAutomation. Want enterprise services such as failover and redundancy right from the off? Get in touch to request an advanced level of trial support. Whether you're a new customer just starting out a free trial, or an existing customer updating your edition, our team is here to help. Need help with setting up? Our support team can help. After your trial is complete you can purchase a licence to unlock your product. Your existing setup will be retained. Prefer an online demo instead? Click here to request one. What are you looking to automate? Enter your details below and we'll get in touch to give you a guided product tour.